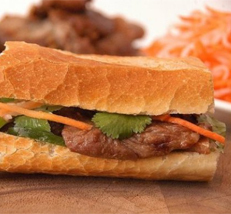 Vietnamese sandwiches have many variations. Some are made of pork, or chicken, but my recipe is made with grilled beef. I hope you try this and enjoy it with your family. Make the slaw: In a small saucepan, combine the water, sugar, and vinegar, and bring to a boil. Transfer the vinegar mixture to a bowl and cool. Add the carrot and daikon, mix well, and season with salt. Set aside to marinate for 30 minutes or store in the refrigerator up to overnight. Marinade the beef flank for about I hour and cook on the grill over medium to high heat. Cook the beef to your preference, but it tastes best cooked to medium. Make the sandwiches: Preheat oven to 400 degrees F. Slice the baguettes open lengthwise, and slather the insides with mayonnaise. Arrange the baguettes on a baking sheet and bake until hot and crusty about 5 minutes. Remove the baguettes from the oven, and immediately. Fill each with some sliced grilled beef, 1 teaspoon soy sauce, 1/2 tablespoon cilantro, 1 slice cucumber, ground pepper, and some slaw. Serve immediately. If you are interested and have any questions about the services we provide, or would like to see our facility and meet Dr. Cao.